By Stephen Sherman, Mar. 2001. Updated June 30, 2011. 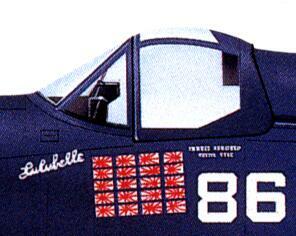 Modeller's love it: Major Gregory "Pappy" Boyington's F4U-1A Corsair, decorated with 20 little Japanese flags, adorned with the nickname Lulubelle, and just below the canopy stencilled "Gregory Boyington, Major - USMC." There's even a contemporary photograph of Pappy in the famous plane. The only problem is that it was really nothing more than a "photo op." Boyington never flew #86 in combat. In fact, the Marine fliers during the Solomons campaign flew any plane they could get. It wasn't like the Eighth Air Force in Europe, where each pilot had a personal plane and supporting crew. At the end of a thin supply line, largely dependent on Navy logistics, dedicating specific planes to specific pilots was a luxury the Marines just didn't have. Also, it's my speculation that the Marines, as a "Naval" service, followed the habits and customs of the senior service. The Navy pilots, operating from cramped carriers, always shared planes. Those scheduled for flights piled onto a vehicle--often a sagging, overloaded jeep, perhaps a larger weapons carrier--for a ride down to the flight line. The pilots did not have preassigned Corsairs. No one, including Boyington, had a personal airplane. Instead the jeep rolled down the line past the revetments, where an enlisted plane captain waiting by each Corsair signaled either "thumbs up" or "thumbs down." In the dark he used a hooded flashlight. If the signal was affirmative, a pilot jumped from the jeep and climbed in; if the plane was grounded, the jeep simply rolled to the next plane in line. Bruce Matheson later remarked on the informalities. "Off you'd go with no idea what the tail numbers were, whose squadron [the aircraft] belonged to, nothing. They were just airplanes, there to be flown. Looking back on it, the absence of record-keeping was unbelievable. We kept our own log books. There were no Yellow Sheets. There was no such thing as writing down anything, when you came back from a hop, which had to do with maintenance. When you came back, some young kid naked to the waist would bring you in, put chocks under it and say, "What about it?" You'd say, "It's okay," or "fix the radio," and walk away from it." But the illustrations of Pappy's alleged plane, Bu. No. 18086, reveal a lot of interesting stuff about the Corsair, about PR, and about Boyington's own life. The huge engine dictated much of the plane's design. Such a powerplant needed a comparably big propeller to absorb all that horsepower. Thus the 13' 4" diameter Hamilton Standard prop, the largest fittest to a fighter at that time. The Corsair's fuselage had to be high in the air, to give the prop clearance, But ordinary, straight wings at that height would have implied long (and weak) landing gear. The distinctive bent wings were developed to permit a reasonably short undercarriage. The XF4U first flew in May 1940, and in October flew faster than 400 MPH, a record for a production fighter. A major re-design pushed the cockpit back 32 inches, which resulted in poor forward vision for the pilot, at least on take-off and landing. Development continued into 1942, when Vought delivered the first production F4U-1 to the Navy, which didn't like what it saw, especially when compared to the easier-handling, and very capable F6F Hellcat. The F4U had dangerous stall behavior, had tendency to yaw suddenly when landing, and, worst off all, bounced when it hit the deck. For use on carriers, these problems caused the Navy to insist that they be fixed, while it went ahead equipping with the Hellcat. a better visibility bubble-top canopy. The different canopy tops show clearly in the illustrations. a more powerful engine, the R-2800-8W. Equipped with water-injection, this engine could achieve 2,250 horsepower for brief periods. This list of changes is typical for the modifications made in WWII aircraft, as the manufacturers absorbed the lessons of the battlefield and adapted the airplanes in response. The F4U Corsair went on through many different models. 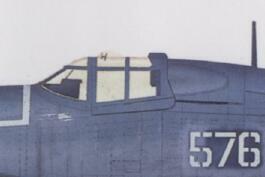 It saw service in Korea, where Guy Bordelon flew an F4U-5N to become the Navy's only prop ace of that war. The Corsair remained in production until 1952 (over 12,000 built), they served with many nations' air forces until the 1960s. Corsairs flew their last combat misions in the 1969 "Soccer War" between Honduras and El Salvador. In November 1943, Pappy was publicly credited with 20 aerial victories (his actual total was almost certainly less, but that's another story). The press had begun to pay attention to the Marine Corps ace. On November 26, at Turtle Bay on Espiritu Santu, Boyington posed in the cockpit of plane #86, decorated with 20 little Rising Sun flags, and painted Lu**belle. The bystander's arm obscures two letters of the word, which was either Lucybelle or Lulubelle. At the time, Boyington was involved with Mrs. Lucy Malcolmson, and Frank Walton recalled the name on the plane as Lucybelle. Makes sense, at the time. But after their messy break-up, Lucy kept $15,000 of Boyington's money that he had entrusted to her. In later years, Pappy stated that the name on the plane was Lulubelle. As Bruce Gamble put it, "He had about fifteen thousand reasons to forget Lucy, each one worth a dollar." So even the apparently innocuous nose art of a Corsair illustrates some of the themes of Pappy's troubled life -- his difficulties with money, women, and the truth. If you look carefully at the photograph (or the illustration at the top of this page), you can see that some of the Jap flags are reversed. Why? Some careless news guy just slapped the decals on there for the photo shoot. And some of them ended up backwards. The next day, Boyington boarded an R4D for Vella Lavella, leaving #86 far behind, never sitting in it again. There were more photo ops. Frank Walton, the Air Combat Intelligence Officer (ACIO), was a talented writer himself, and went along with the press coverage of Boyington. On day, they staged a pretty good event for the cameras. The World Champion St. Louis Cardinals offered to trade Boyington one of their baseball caps for each plane shot down. One photo shows a grinning Greg Boyington exchanging a stack of little Jap flags for a stack of hats. In the most well-known photo, now on the cover of The Black Sheep ... Marine Fighting Squadron 214 in WW2, all the pilots stand on a Corsair, while Boyington, Bolt, Magee and the other aces stand in front with baseball bats in their hand. Other photos featured Black Sheep aces perched on the wing of #740, aiming bats like guns. What was their ultimate disposition? Number 915 definitely wound up at the bottom of St. George's Channel; the others were almost certainly scrapped. Only a handful of Corsairs survived. The profile paintings on this page are from Mark Styling's Corsair Aces of World War 2, #8 in the Osprey Aircraft of the Aces series.